The dBrochure takes a physical print piece to the highest level of brand engagement. By adding cutting-edge technology via features such as embedded video formats, interactive user controls buttons, stereo and more, you’ve immediately got your customer’s attention. With dBrochure, there are no distractions just your message in your viewer’s hands. It offers full customization with various sizes and formats. With a dBrochure, there are no distractions. Just your message in your viewer’s hands, right before their eyes and ears. 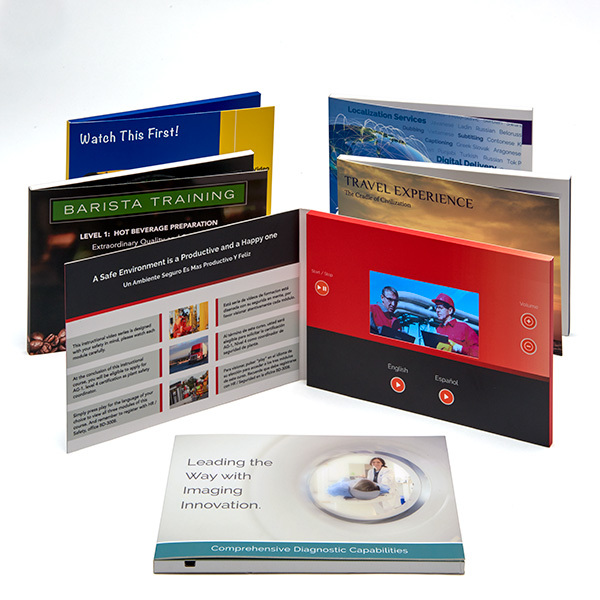 Our fully customizable dBrochure leverages digital and tactile communication technology to deliver your message immediately. It’s the marriage of traditional media kits with cutting-edge video embedded technology, tailored to help your company drive impactful results. The benefit: instant marketing messaging that literally speaks directly to the intended audience. - Provide the perfect collateral material that will make a visual, audio and tangible impact for fashion, travel, spa, real estate and automotive. - Empower sales teams with an unforgettable “leave behind” for use at sales calls, tradeshows and conferences. - Enhance your corporate training and general corporate messaging. - Enable a more effective implementation of procedures/policies; communicate the latest technological innovation for health providers and pharma. - Demonstrate visually product use and information to end use consumers. - Offer a high-tech and impressive vehicle for clients to convey their brand and messaging. CMI can localize your embedded video to extend the dBrochure’s reach to multi-language markets.